A balance of colorful visual and aural poetry, elegant plot structure, and battles marked by a swift graphic intensity and epic scope. 99 min. Miramax Films. Director: Zhang Yimou. Cast: Jet Li, Tony Leung, Maggie Cheung, Ziyi Zhang, Chen Daoming. Hero--the first martial-arts film from celebrated Chinese filmmaker Zhang Yimou (To Live)--tells a meditative story with a balance of colorful visual and aural poetry, elegant plot structure, and battles marked by a swift graphic intensity and epic scope. Hero is a desolate tragedy of living by the sword and dying by the sword, with personal suffering weighed against the suffering of a people; as such, the film goes to the heart of our assumptions about heroism, questions them, and puts them to an ultimate test. Hero will inevitably draw comparisons to Akira Kurosawa's Rashomon, since Zhang's film—as scripted by Li Feng, Wang Bin, and Zhang—employs alternate narratives to sort through the crossed motives of a conspiracy of assassins. The film takes place in the kingdom of Qin, one of seven kingdoms in China's pre-unification period of warring states. Chin Shi Huang Di (Chen Daoming) rules Qin from behind masses of loyal troops, on guard against the constant threat of assassination. Three assassins stand above the rest: Broken Sword (Tony Leung Chiu-Wai), Flying Snow (Maggie Cheung) and Sky (Donnie Yen). At the film's outset, a warrior known only as Nameless (Jet Li) arrives at Qin's palace to tell the story of how he defeated the three assassins on behalf of the kingdom. Zhang's design of the film is as savvy as it is artful, with China's biggest stars in the leads (Zhang Ziyi plays the loyal servant to Broken Sword, though Jackie Chan turned down the role of the King). Dynamic camerawork by Christopher Doyle—who photographed Tony Leung Chiu-Wai and Maggie Cheung in Wong Kar-Wai's likewise ravishing In the Mood for Love—serves Zhang's rigorous, symbolic color scheme, lush composition of landscapes, and deft unity of fight, stunt, and wire work. Taking in the natural splendor of golden leaves stirred by the wind or water barely disturbed by flying, skipping duellists, Zhang stays at least as attendant to the story's beauty as its brutality. Zhang gets to the music of the many sword duels, with furious sight and sound, flowing robes and singing swords. The subtitled dialogue is simple and deceptively to-the-point ("Since you want to die, I shall assist you"), and the images of Doyle and composer Tan Dun, with a fiddling assist from Itzhak Perlman, also pulse with deeper meaning. The screenwriters liken music, as well as calligraphy and chess, to the zen of fighting. Filmmaking, with its strategy and delicacy, would also make a fine analogy. Zhang is the calm eye at the center of stormy spectacles: amassed troops with horses and flags, hails of arrows, and panoramic spaces. American mainstream audiences will see Hero as the heir to Ang Lee's Crouching Tiger, Hidden Dragon, though Zhang arguably trumps that fine film with his broader canvas. Zhang invites contemplation of relative planes of existence, particularly a deeper level of perception, and therefore living; this plane may only be accessed through the inner peace of outward-looking ideals. The assassins are, in large part, motivated by vengeance, the rotary motor of long-term warfare. One assassin advocates, in the name of China ("Our Land"), letting go that which one has toiled to perfect—be it swordsmanship or even, perhaps, life—if that sacrifice will purchase a greater good. Hero debuted in China almost two full years ago, and a large American audience has already experienced the film on imported videos. 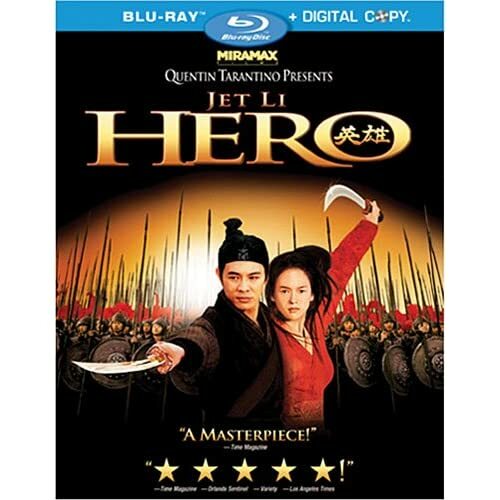 Though director Zhang Yimou was forced to cede to Harvey Weinstein's demand to trim Hero to less than 100 minutes (the director's preferred cut runs 108 minutes), Hero remains a genre masterpiece by a great filmmaker. The film begins with an epigraph: "People give up their lives for many reasons. For friendship, for love, for an ideal. People kill for the same reasons...In any war, there are heroes on both sides." The spirited Hero proves itself timely and timeless; every warrior is human, with the attendant vulnerabilities of desire, fury, love. So too is every human potentially heroic. Though the hi-def transfer of Hero looks its best yet on Blu-ray, the image still suffers from inconsistency. Variable sharpness is no doubt due in large part to what's there in the source material, which leans toward a softer look than many films. Less excusable are intermittent digital artifacts such as signs of DNR application, but on the whole, the picture quality here is really quite good: colors achieve the requisite wow factor, and the image is simply much more defined in its Blu-ray incarnation. The disc's audio presents a more obvious issue for home theater nuts: while there's an impressive, lossless DTS-HD Master Audio 5.1 mix here, it's given to the English dubbed soundtrack and not the film-buff preferred original Chinese soundtrack. Purists like me will always default to the original audio, which here comes in a "lossy" Dolby Digital 5.1 mix. It's still a darn good track—and for mortal ears like mine, it'll do just fine—but all the same, it's a disappointing choice on Disney's part. The Blu-ray retains the bonus features from the previous (and apparently out-of-print) DVD edition. The compact "Close-Up of a Fight Scene" (9:18, SD) features ample behind-the-scenes footage and interviews with Quentin Tarantino, Jet Li, Donnie Yen, Zhang Ziyi, Maggie Cheung, and Tony Leung. 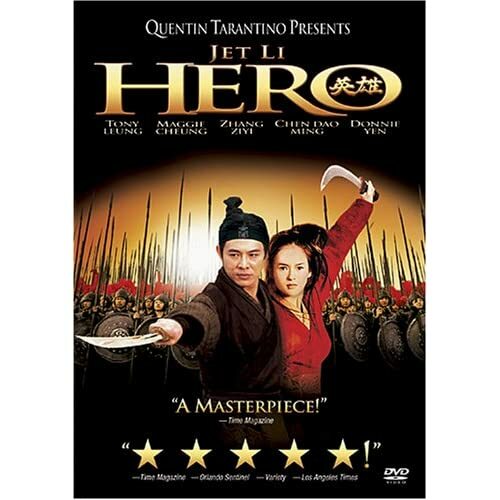 "Hero Defined" (24:01, SD) uses similar tactics to go more in-depth with director/producer Zhang Yimou, director of photography Christopher Doyle, composer/conductor Tan Dun, action director Tony Ching Siu-Tung, Maggie Cheung, Jet Li, Zhang Ziyi, Tony Leung, Chen Dao Ming, and Donnie Yen. Also here are four "Storyboard Comparisons" (5:21 with "Play All" option, SD) and the jewel of the extras: "Inside the Action: A Conversation with Quentin Tarantino and Jet Li" (13:55, SD). This geek-out meeting of the movie-cool-defining minds is something to behold. As an added bonus, a Digital Copy for the option of portable playback is included on a second disc. The graduation of this must-own movie to the top format on the market is an event; it's definitely worth a first-time purchase, and makes a strong case for an upgrade to owners of the relatively dull-looking DVD. All site content © 2000-2019 Peter Canavese. Page generated at 04/24/2019 07:22:28AM.